I’m off to a conference in Las Vegas this week – I’ll be speaking to a group of my colleagues in IBM Software Services for WebSphere on some Message Broker topics, and helping with some practical education sessions. I’ll try to blog from there, but it will obviously depend on time, and network availability. Leaving in the morning. I’ve decided not to take my camera. It was a very hard decision, but frankly it will be bulky to carry on the flight and around with me during the day, and I’m simply not sure how much time I’ll have for photography. I’m sure I’m going to miss it when I’m there. Unless any other options present themselves, it will be the inbuilt camera on my phone, which is very poor quality. I decided that my first task would be to build a screen, with a goal of trying to display an image from my Flickr account. I found an interesting article on O’ReillyNet about how to run a PowerPoint presentation inside SL. Rather than following the suggested method of uploading images / slides as images, I decided to try the alternative method from the comments on that article – pointing my screen at a media stream which was, in fact, my image, since apparently the QuickTime player in SL should support JPEGs. Initially, I didn’t see an image. So I then tried deeding my object to the group. Unfortunately, at that point I failed to be able to modify the object any more, so I guess I messed up the permissions somehow. In the end, I had to delete my screen, and will have to wait for another opportunity to play with this function. In other Second Life news, as of yesterday the population had grown to 200,000 residents. Regular readers will remember that one of my bugbears with the migration from Blogger to WordPress was the lag in Google reindexing my new site (refs 1, 2, and 3). I freely admit that my blog has a low hit rate, so Google and other search engines have been key to attracting interest so far. 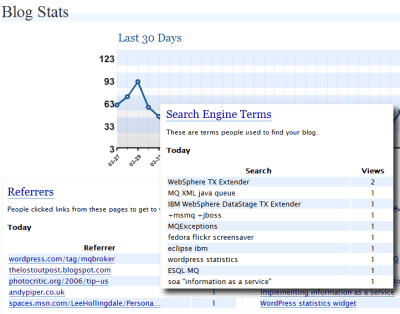 I prefer this interface far more than the one provided by the SiteMinder stuff I’d hacked into Blogger. For starters, I can see the search terms in plain text. The graphs and things are nice, too. Found via Ross Burton’s blog – Has Bean Coffee. I’m going to try them the next time we run out.